7-31 PROGRAM TRACKING AND REPORTING SUBSYSTEM (PTRS) ACTIVITY CODES. A. Operations: 1711, 1712, 1725. B. Maintenance: 3711, 3712, 3720. C. Avionics: 5711, 5712, 5720. 7-32 GENERAL. This volume supplements Federal Aviation Administration (FAA) Order 8020.11, Aircraft Accident and Incident Notification, Investigation, and Reporting, for investigations of incidents, occurrences, and accidents. However, Volume 7 will be used when investigating pilot deviations (PD) and near midair collisions (NMAC). A. Field Offices. For the purposes of this section, the term “field office” will be used to describe various FAA offices, to include Flight Standards District Offices (FSDO), certificate management offices (CMO), International Field Offices (IFO), and the generic term certificate-holding district offices (CHDO). B. Investigations. It is important to keep in mind that investigations of occurrences are a critical component of the Flight Standards Service mission to ensure safety in the National Airspace System (NAS). These investigations can identify precursors to an accident or a safety concern, and are an opportunity for FAA offices to actively collaborate with airmen and operators to mitigate any future reoccurrence of such events. C. Interaction With the Air Traffic Organization (ATO). 1) ATO Quality Assurance Group (QAG) and Quality Control Group (QCG). The ATO QAG and QCG work together in providing occurrences and related data to the Flight Standards Service. The ATO QAG identifies occurrences that may require Flight Standards Service action and forwards necessary information via the Air Traffic Quality Assurance (ATQA) database, the Comprehensive Electronic Data Analysis and Reporting (CEDAR) database, email notices, or other means to the respective Flight Standards Service office of jurisdiction for the investigation. The ATO QCG is responsible for providing additional data needed by investigators after forwarding of the occurrence by the ATO QAG, and data needed by the Flight Standards Service to investigate events reported from sources other than air traffic control (ATC). This guidance uses the ATO QAG in reference to both QAG and QCG. 2) Use of ATQA. Regardless of the method of notification, ATQA is the system that Flight Standards Service personnel will use to enter and close out electronic forms used during the investigation of PDs and other occurrences for which forms exist in ATQA. For additional information on accessing ATQA, see Volume 7, Chapter 1, Section 1, subparagraph 7-3E, Notification of Occurrences. All available Flight Standards Service reporting forms are listed in subparagraph 7-39B. 7-33 DEFINITIONS. Inspectors involved with the investigation of an incident or occurrence should have a clear understanding of the definitions that follow. Refer to Order 8020.11, chapter 5, to review the investigative and reporting procedures for incident investigations. • Other serious incidents (as described in 49 CFR § 830.5(a)). NOTE: Wildlife reports must be investigated in accordance with Order 8020.11 as an incident/accident as determined by the ASI’s investigation. The procedures in AC 150/5200-32 are voluntary on the part of the pilot/operator. However, ASIs should encourage operators/pilots to report the wildlife strike so the Airports Safety and Standards group within the Airports Division can assess what mitigations are necessary to remove the hazard. C. FAA Form 8020-23, FAA Accident/Incident Report. FAA Form 8020-23 shall be prepared for each aircraft incident described in subparagraph 7-33B above, except for NMACs and PDs (which are reported using FAA Form 8020-15, Investigation of Near Midair Collision Report, and FAA Form 8020-18, Investigation of Pilot Deviation Report, respectively). D. Correlation Between an Occurrence, an Accident, and an Incident. Until the investigating ASI can identify an event as an accident or incident, it will be regarded as an occurrence. The advantage of labeling an event as an occurrence is that it allows for an assessment of the risk and investigation of the facts for an accurate classification of the event without generating unnecessary reports. No matter how the event is ultimately classified, Flight Standards Service personnel must in all cases take appropriate action to address any deviations from regulations or other standards. E. ATC Reports to the Flight Standards Service. ATC uses Mandatory Occurrence Reports (MOR) and Electronic Occurrence Reports (EOR) to collect preliminary event information. ATC is mandated to report all observed or suspected occurrences that meet the MOR criteria (refer to FAA Order JO 7210.632, Air Traffic Organization Occurrence Reporting). Additional nonmandatory reports that reflect potential safety issues may also be forwarded by the ATO. ATC/ATO will initiate the appropriate notification and forward the preliminary reports/information to the Flight Standards Service. It is the Flight Standards Service’s responsibility to analyze and validate the reports (or other notification) and data provided by ATC. If validated, Flight Standards Service personnel will take appropriate action(s) to address the underlying cause of the problem and prevent future reoccurrence of the event by the respective operator, pilot, or crew. F. Unmanned Aircraft Systems (UAS). Small UAS are defined in § 107.3 as unmanned aircraft weighing less than 55 pounds on takeoff, including everything that is on board or otherwise attached to the aircraft. Note that part 107 addresses requirements for small UAS. For additional information for all UAS incidents or accidents, see Volume 16. G. Pilot Deviations (PD). PDs may be more broadly defined within other lines of businesses. PDs are the actions of a pilot that result in an apparent deviation from 14 CFR or a North American Aerospace Defense (Command Air Defense Identification Zone (ADIZ)) tolerance. Flight Standards Service personnel should keep this definition in mind when working with other lines of business (LOB) to determine if a PD has potentially resulted in a deviation from 14 CFR and if additional investigation or action is appropriate. NOTE: Remote pilots operating UAS are pilots when evaluating PDs and implementing this guidance. EXAMPLE 1: A small jet, whose make, model, and series (M/M/S) is also used in civilian operations, is being flown by the military. The airplane is involved in an accident while on an approach to Miramar Naval Air Station, injuring the military pilots and occupants. The military conducts an accident investigation, but also invites the National Transportation Safety Board (NTSB), FAA, and the aircraft manufacturer to participate, because all parties have a mutual interest in determining what caused the accident. EXAMPLE 2: A military fighter jet, whose model was designed purely for military operations and was never designated as a civilian aircraft, is flying over Reading, PA, on a training flight at 6,000 feet. Normally, there would be no mutual interest if there were an incident with this military aircraft. However, an FAA air traffic controller who is working the airspace in that area provides an improper vector, and the fighter jet nearly collides with an N-registered civilian aircraft. The military and the FAA have a mutual interest in the event. A. Field Office Investigations. Field office investigation will be conducted in accordance with the following. • Volume 14, Chapter 1, Section 3 for providing written notification of an investigation under the Pilot’s Bill of Rights (PBR). 2) Events Involving UAS. Events involving UAS operations that are reported will be primarily investigated by a field office Operations ASI. In general, events involving UAS will be investigated using the same overall policy and procedures as for manned aircraft. See Volume 16 for specific information pertaining to UAS. a) FAA Flight Program (see Volume 6, Chapter 11, Section 3 for additional information). b) PAO to determine operation compliance requirements. See Volume 3, Chapter 14, Section 2; AC 00-1.1, Public Aircraft Operations (this contains additional guidance on government aircraft operations); and Title 49 of the United States Code (49 U.S.C.) §§ 40102(a)(41) and 40125.
c) FAA Order 2150.3, FAA Compliance and Enforcement Program. 4) Regional Manager or Office Support. If an Operations ASI is not available to conduct the investigation, the field office manager or Front Line Manager (FLM) will contact his or her regional manager or office for assistance to resolve the concern or to assist with the investigation. 1) Ensure timely completion of reports and forms. 2) Provide and coordinate additional resources as necessary. 3) Assign regional points of contact (POC). 4) Analyze regional events quarterly to identify trends. 5) Regarding voluntary reporting programs, evaluate the effectiveness of implemented mitigations, and coordinate with the respective field office(s) regarding the effectiveness of actions taken and implemented. C. Monitoring Foreign Operator Investigations. The IFO managers are responsible for monitoring and conducting the investigations of the holder of a Foreign Air Operator Certificate (AOC) issued by their office in accordance with 14 CFR parts 129 and 375. See Volume 12 for detailed guidance. 7-35 NOTIFICATION OF OCCURRENCE. Field offices normally receive occurrence notification from an FAA facility through the ATO QAG, a non-FAA ATC facility, or a report from a pilot/flightcrew member, individual, or ASI who observed an occurrence. If notification is received from a source other than an FAA facility, the ASI will follow this process. A. Incident and PD Action. ASIs should initiate investigative actions within 10 calendar-days of receipt of notification of an occurrence, in order to determine what mitigation will correct the problem, and close FAA Form 8020-18 within 90 calendar-days. 1) Incident Notification from an FAA Facility. When ATC provides FAA Form 8020-9, Aircraft Accident/Incident Preliminary Notice, to the Flight Standards Service, the ASI will comply with Order 8020.11. 2) ATC Safety Concern Notification. The responsible office may receive a report from an ATC facility regarding a safety concern they feel the Flight Standards Service should be aware of. This notification may be in the form of an electronic form, an email, a telephone call, or a fax. In such cases the ASI assesses the report and determines what (if any) corrective action is warranted. ATC safety concern notifications may, for example, concern lack of qualifications, careless or reckless conduct, Aviation English Language Standards (AELS), landing (or attempted landing) on a surface other than what was cleared by ATC, or other pilot knowledge or proficiency issues that ATC identifies as a safety concern. If the ASI takes action, he or she will see Volume 7 to assess the report and Volume 14 to determine the appropriate action. 3) PDs Within FAA-Controlled Airspace Notification. The ATO QAG will forward notification of PDs that occurred within FAA-controlled airspace to the respective field office, as appropriate. 4) U.S. PDs Within Foreign-Controlled Airspace Notification. The International Operations Branch (AFS-52) will forward reports that it receives from a foreign Civil Aviation Authority (CAA) of U.S. PDs in foreign airspace to the respective field office, as appropriate, via email, until the Portal for International PDs (PIPD) is operational. B. Notifications from Non-FAA Air Traffic Control Towers (Federal Contract or Military). a) Determine if the ATC facility for the controlling airspace has data related to the event: If yes, request the ATC facility or the ATC QAG to submit FAA Form 8020-17, Preliminary Pilot Deviation Report (or the MOR) to the FSDO. b) Begin assessing the event and initiate the appropriate response form (see subparagraph 7-39B). If there is no FAA Form 8020-17 associated with the event, indicate in the response form the reason why (e.g., the report was made directly to the FSDO and no FAA ATC data exists). a) Determine if the ATC facility for the controlling airspace has data related to the event: If yes, request the ATC facility or the ATC QAG to submit FAA Form 8020-17 (or the MOR), and any associated data, to the FSDO, and then initiate FAA Form 8020-18. Request any information that the contract tower has regarding the event. b) Begin assessing the event and initiate the appropriate response form (see subparagraph 7-39B). If there is no FAA Form 8020-17 associated with the event, indicate in the response form the reason why (e.g., the report was made directly to the FSDO by a military tower and no FAA Form 8020-17 was filed). • A brief description of the deviation, with appropriate comments, including whether a Brasher Notification was issued. NOTE: A Brasher Notification is a notification by ATC that the pilot may have caused a PD and that the pilot is to call the phone number provided by the issuing ATC facility as soon as possible after landing. D. Insufficient or Conflicting Occurrence Report Information. 1) Reports Submitted by the ATO QAG. If the occurrence report does not contain sufficient information or contains conflicting information, the investigating ASI will notify the ATO QAG and request clarification or additional information. If ATC is unable to clarify the issue, the ASI will follow the procedures in the following paragraphs to close out FAA Form 8020-18. Note that a lack of information in the report is not a basis to file FAA Form 8020-19, Reclassification of Aviation Incident Report. 2) Reports Not Submitted by the ATO QAG. a) If the ASI cannot obtain information regarding the occurrence to verify the event as a PD, then the ASI will open FAA Form 8020-18 and close out the report, stating insufficient information to continue the investigation. b) If the ASI determines from the evidence obtained that a PD did not occur, then the ASI will close out FAA Form 8020-18 by stating the evidence does not support the occurrence as a PD. The ASI will then initiate FAA Form 8020-19 to reclassify the event. 7-36 FLIGHT STANDARDS SERVICE PD NOTIFICATION AND INVESTIGATION PROCEDURES. As set forth below, particular FAA offices are responsible for conducting the investigation and appropriate coordination, depending on the category of individual or entity. If the incorrect office receives a report it will comply with the procedures in subparagraph 7-36B. See Figure 7-4, Pilot Deviation Action Flowchart. 1) PD Determined. If the ASI determines that a PD occurred after assessing ATC data and/or other information, the investigating FSDO will refer to the Compliance Action Decision Procedure in Volume 14, Chapter 1, Section 2 to determine the appropriate action. 2) PDs Committed by U.S. Military Personnel. ATCs will send PDs committed by members of the U.S. military, while in the performance of their official duties, to the Flight Standards Service FSDO of jurisdiction for the area of the occurrence and the ATC facility’s military liaison. 3) U.S.-Certificated Air Operator PDs. Regardless of where the aircraft lands, or whether or not passengers are on board, if the aircraft is listed on the operations specifications (OpSpec) or management specifications (MSpec) of a 14 CFR part 121, 125, 135, or 91 subpart K (part 91K) operator, the field office that issued the certificate will investigate the event. When PDs of commercial operators occur in foreign airspace, the respective CAA notifies AFS-52. AFS-52, after confirming information, aircraft, actions, and locations, will forward the notification to the appropriate field office with responsibility over the operator or region of aircraft ownership/pilot residence. 4) Non-Part 121, 125, 135, or 91K-Certificated Operator PDs. a) The field office of jurisdiction investigates PDs by pilots of noncertificated operators (e.g., part 91 operations for which an FAA certificate is not required). However, if the event involves the use of an LOA issued by another field office, the investigating office will coordinate with the issuing office. b) For PDs of noncertificated operators occurring in foreign airspace, the respective CAA notifies the International Program Division (AFS-50). AFS-50, after confirming information, aircraft, actions, and locations, will forward the notification to the appropriate field office with responsibility over the operator or region of aircraft ownership/pilot residence. 5) Foreign AOC Holder PDs. Regardless of where the aircraft lands, or if passengers are on board or not, if the aircraft is listed on OpSpecs (part 129) or a part 375 operator, the responsible IFO will investigate the event and proceed with appropriate corrective action. See Figure 7-4 and Volume 12 for detailed information. 6) Foreign Military PDs. The FSDO of occurrence will investigate the occurrence and forward the assessment and evidence of the PD to the IFO that has responsibility for the country of the military aircraft. 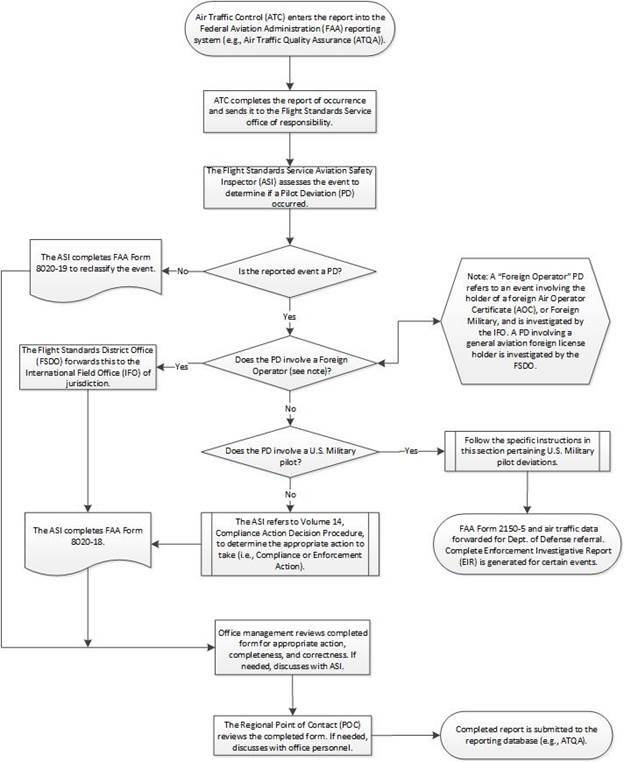 See Figure 7-4 for the Pilot Deviation Action Flowchart. Refer to Order 2150.3 and Volume 12 for detailed information. a) Close Out PTRS. After coordination between the IFO of jurisdiction for the country of aircraft registry and the investigating FSDO, the IFO and the FSDO will close out their respective PTRS records, describing the actions they have taken. b) Close Out FAA Form 8020-18. The investigating field office will close out FAA Form 8020‑18 and record the action(s) taken in the narrative section. For example, “The event is forwarded to the IFO of international responsibility to forward to the responsible CAA.” See Volume 12 for detailed information. 7) PDs by Persons Residing Outside the United States. This subparagraph applies to investigating and obtaining information on pilots holding an FAA-issued pilot certificate, and holders of a foreign pilot license (not operating under a foreign AOC), who reside in a foreign country. Deviations committed by such individuals will be referred to the FSDO of occurrence for investigation, which will proceed with the appropriate corrective action. When it is necessary for the FSDO to obtain evidence through a foreign government, the investigating FSDO will obtain assistance from the IFO having international responsibility for that geographical area to obtain evidence or statements. See Figure 7-4 and refer to Order 2150.3 for additional information. a) IFO Action. The IFO having international responsibility for that geographical area will assist in the investigation and/or participate in the corrective action, and will open a PTRS record explaining its participation in the investigation and corrective action. They will indicate that they reported back to the investigating office the effectiveness of the action taken or if additional action is necessary. b) Close Out PTRS. The IFO of jurisdiction for the country of aircraft registry and the investigating FSDO will close out their respective PTRS records, describing the actions they have taken. c) Close Out PD Report Form. The investigating field office will close out FAA Form 8020-18 and record the action(s) taken by the FAA in the narrative section. 8) Violations by Transport Canada Civil Aviation (TCCA)-Licensed Airmen. Violations committed by airmen exercising a TCCA license, when legal enforcement action is not taken, are referred directly to Transport Canada. Refer to Order 2150.3, chapters 4 and 6, for additional information. 9) Persons Exercising a Foreign Pilot License. Unless otherwise addressed in subparagraphs 1) through 8) above, regulatory deviations committed by persons exercising privileges of their foreign license are referred to the appropriate foreign aviation authority through the Department of State. FAA personnel cannot address a regulatory deviation committed by persons exercising privileges of their foreign license with a Compliance Action (CA) or administrative action. Flight Standards Service personnel will create an Enforcement Investigation Report (EIR) and forward this to the FAA Office of the Chief Counsel (AGC) for processing. a) As an example, a person who holds a foreign pilot license is operating an aircraft of the same foreign registry. That individual commits a PD and the Flight Standards Service is notified of the event through ATC. The Flight Standards Service investigates the deviation, collects evidence, prepares the EIR, and forwards the EIR to AGC through the normal coordination process. b) If a person commits a regulatory deviation while exercising the privileges of a pilot certificate issued by the FAA containing a limitation that requires the certificate to be accompanied by a foreign license (i.e., an FAA certificate issued per 14 CFR part 61, § 61.75), the FAA may apply the Compliance Action Decision Procedure in reference to the FAA-issued certificate. In these instances the FAA may address the regulatory deviation with a CA, administrative, or legal action. However, if the event requires the FAA to take enforcement action against the FAA-issued certificate, Flight Standards Service personnel shall contact AGC to discuss whether or not the event should also be referred to the foreign aviation authority. c) For additional information, refer to Order 2150.3, chapter 6. 1) The field office of jurisdiction for the Flight Standards Service region of occurrence investigates PDs of pilots for noncertificated operators. 2) Certificated operator. The certificate-issuing field office will investigate events for their part 121, 125, 135, or 91K operators. The investigating office will close out the event after receiving notification from the office of jurisdiction that all corrective action(s) are completed, or may initiate additional corrective action based upon the report. 3) If the preliminary report was sent by ATC to the incorrect office, the receiving office will, within 5 business-days, find the correct office and notify that office of the need for investigation. For reports filed in ATQA, the receiving office must contact the MyIT help desk and request the report be routed to the correct office. For reports received directly from the ATO QAG, coordinate with the ATO QAG to ensure the correct office receives access to the information required for the investigation. 4) Regarding deviations by foreign operators, coordinate the correct IFO of jurisdiction with AFS‑54. C. Investigation Process. The overall purpose of the investigation is to assess whether a PD has occurred, determine the appropriate action, and complete the required documentation. The ASI must follow the process described below. 1) Initial FAA Investigative Actions. a) The ASI will review the preliminary occurrence information (such as FAA Form 8020-17) and relevant ATC data posted to the ATC Knowledge Services Network (KSN) site and global KSN site. b) Note that if the event was reported by a source other than ATC, the ASI will need to coordinate with the ATO QAG to extract all available data and post the data to the KSN site as soon as possible. c) If, based on the preliminary information and ATC data, it appears that a PD has not occurred, the ASI shall complete FAA Form 8020-19 (see subparagraph 7-36C8) below). NOTE: The ASI should refrain from contacting the pilot/owner/operator referenced in the Preliminary PD Report until the ASI determines, solely upon the information in the report and the ATC data that the event appears to be a PD or other safety concern. d) The ASI should create a PTRS entry and begin to document the event in the comments section as appropriate. 2) Additional Information Concerning ATC Data. a) The ASI must determine whether the data provided by ATO is sufficient to complete the investigation. 1. If additional data is required, notify the ATO QAG as soon as practical. Note that Flight Service Station (FSS) information (such as flight plans) may have short retention periods and will require additional action by the ATO QAG to obtain. If FSS data is needed, the ASI must contact the ATO QAG as soon as possible. 2. If at any point in the investigation an inspector concludes that enforcement action is likely to occur, notify the ATO QAG to have the ATC facility preserve data necessary to prepare a full certified data package. This determination must be made within 38 calendar-days of the event to allow the ATC facility to retrieve the data before the 45-calendar-day retention period expires. b) If it is later determined that the data is not necessary (i.e., it is later determined that a PD did not occur), notify the ATO QAG that the data is not required. 2. If the above option is not feasible, the inspector should collaborate with the ATO QAG to have the certified data package submitted directly from the ATO QAG to the requesting party. d) Flight Standards Service personnel may need to collaborate with ATC if ATC requests information from the investigating office relating to the event (e.g., pilot statements to assist them in their safety initiatives). The investigating office will provide the requested information as ATC’s investigation evolves. e) If the inspector obtains additional ATC information, the ASI will contact the ATO QAG and request that the data be posted to the KSN site. 3) Determine Additional Investigation Coordination and Resources. a) Based upon assessment of the preliminary occurrence report and ATC data, the ASI will determine the resources necessary to conduct the investigation. While the ASI should plan to collect any additional information necessary, the ASI should only obtain statements or other evidence from sources outside the FAA only to the extent necessary to assess the reported occurrence. b) There should be no delay in obtaining information that is time-sensitive and may be either difficult or impossible to retrieve at a later date, such as weather information, pilot reports, and flight plan information. 1. Pilots or other witnesses involved. 4. The Civil Aerospace Medical Institute (CAMI). • The investigating office may find registration information via a search of the Aircraft Registry. UAS are normally registered, and small UAS have the option of being registered, under 14 CFR part 47.
investigations/leap/) to determine registration status and ownership. • Additional resource information is available at UAS Resources (http://www.faa.gov/uas/resources/) and UAS Frequently Asked Questions (http://www.faa.gov/uas/faqs/). 6. ATC call signs. For assistance regarding call signs, contact AJV-2 at Callsigns@faa.gov or AJR-2 at 9-ATOR-HQ-IFOS@faa.gov. 7. Other Flight Standards Service offices. 8. The RO operations branch. d) Ensure that PBR requirements are satisfied prior to having a detailed discussion concerning the deviation with the pilot(s) involved in the event. For example, if you have not provided the Compliance Philosophy Brochure (see Volume 14, Chapter 1, Appendix 14-1) the inspector could make initial contact to inform the person why they are calling and arrange a time and place (phone or in person) for a detailed discussion. However, before the conversation gets into the substance of the event, the brochure must be provided as described in Volume 14, Chapter 1, Section 3. 4) Actions if a PD is Determined. a) In general, the ASI will refer to the policy and procedures in this volume and Volume 14 to determine the appropriate action to take to address the noncompliance. b) If English language or other references to pilot(s) inability to communicate effectively with ATC are stated in the ATC report of the occurrence, this may indicate that the pilot may not meet the FAA regulatory English language eligibility requirements to hold an FAA certificate. The ASI will see Volume 5, Chapter 14 for the procedures to perform an FAA AELS evaluation and the actions to take regarding the results of the evaluation. • AC 60-28, FAA English Language Standard for an FAA Certificate Issued Under 14 CFR Parts 61, 63, 65, and 107. • AC 61-98, Currency Requirements and Guidance for the Flight Review and Instrument Proficiency Check. • AC 90-109, Transition to Unfamiliar Aircraft. d) For runway incursion PDs, if the ASI determines that the pilot will benefit from remedial training to ensure compliance regarding runway incursions, the ASI will see Volume 14 and Volume 15. Volume 15 contains the specific procedures regarding the Runway Incursion Remedial Training Program. If the ASI determines that the pilot will not benefit from remedial training, the ASI should take the appropriate action to achieve compliance. e) For PDs involving landing on a surface other than that cleared by ATC, the ASI will complete FAA Form 8020-18. These incidents include landing on a runway, taxiway, or other surface for which he or she was not cleared. The ASI will also complete FAA Form 8020-18 for reported events in which a pilot inadvertently deviated from an ATC clearance or instruction and would have landed on an incorrect surface (or at the wrong airport) had ATC not intervened. • Comments, to capture information not already included in the form. NOTE: ASIs must address the survey questions that are associated with FAA Form 8020-18 within ATQA. The questions to ask the pilot or operator are a great asset to FAA data analysts. The answers to these questions, and the ASI providing any additional information obtained during the investigation process, will further enable the FAA to identify the root causes of runway incursions, improve the trending of such events and their causes, and greatly assist in the development and improvement of training materials and current mitigations. These survey questions can be used as questions to ask the airmen, thereby obtaining important data. NOTE: Depending on the nature of the event, the Flight Standards Service may be notified of a PD by means other than FAA Form 8020-17; however, FAA Form 8020-18 is to be completed (unless the investigation reveals that a deviation has not occurred). NOTE: At the time of publication of this section, a discrete selection for a CA is not included on FAA Form 8020-18. If the Flight Standards Service intends to take a CA to address a regulatory issue discovered as a result of the investigation, personnel select the “Other” box and specify “Compliance Action” (block 20). The specific regulatory requirement that was not met can be included in the Description of Deviation (block 18). a) The ATO QAG provides all available data to the Flight Standards Service through the KSN site. This data is reviewed by the investigating ASI to determine whether or not a PD occurred and whether the event occurred during the performance of military duties. 1. Compile information already in the FAA’s possession (e.g., controller statements, tapes, radar, and transcripts) and from sources outside the FAA relevant to the matter. 2. Complete FAA Form 2150-5, Enforcement Investigative Report. 3. Contact the ATO QAG to determine if ATO has previously provided data relevant to the matter to the appropriate military authority (or FAA military liaison). If so, provide identifying details for this information (such as date provided, file names, ATO personnel that submitted the data, person(s) that received the data, etc.) in any transmittal correspondence to Flight Standards Service regional personnel. 4. Complete FAA Form 8020-18 by indicating in block 18 that the office has referred the matter to legal counsel. c) The ASI also determines if the apparent violation reflects a lack of qualifications (or has raised an issue as to qualifications to hold an FAA certificate). In such cases, Flight Standards Service personnel shall notify AGC. AGC may request that the Flight Standards Service conduct the full investigation and documentation needed to satisfy EIR requirements for legal enforcement actions (i.e., the additional completion of sections B and C of an EIR). d) The ASI will close out the PTRS, stating in the comments section the action taken. e) The investigating office forwards the compiled air traffic data and Order 2150.3 (or complete EIR, when applicable), to the Flight Standards Service RO as soon as practicable following the apparent violation for review. If the documentation is satisfactory, Flight Standards Service regional personnel will forward the compiled information to legal counsel. Identifying details for data previously forwarded by the ATO QAG should also be included. NOTE: A certified data package is only required if requested by AGC or appropriate military authority (or FAA military liaison). f) If the investigating ASI determines that the PD occurred outside of the performance of official military duties, the ASI shall proceed with conducting the investigation as described for nonmilitary PDs throughout this chapter. g) If the investigating ASI determines that a PD did not occur, the ASI shall reclassify the event as provided in subparagraph 7). 7) Submitting FAA Form 8020-18 for Review. When the ASI completes the investigation and finalizes the respective FAA Form 8020-18, he or she submits the form to the office management (via ATQA), who will review the data, mitigations, and recommended action(s) provided by the investigating ASI. a) Per office management concurrence, managers submit their approval for the RFSD/AFS-54 PD POC to review (via ATQA). b) If management does not concur, the investigating office management will return FAA Form 8020-18 to the investigating ASI for reconsideration of data and/or actions taken. a) Reclassification of an occurrence should be based on review of the data provided by ATC, as well as new or additional information obtained by the ASI from conducting the investigation of the occurrence. The ASI should only complete FAA Form 8020-19 if the information does not support the occurrence of a PD. 2. If ATC does not issue a Brasher Notification to the pilot, this is not justification for reclassification. The ASI is to proceed with the recommended mitigation and complete the Investigation of Pilot Deviation Report. 3. Pilot responsibility to listen attentively to an air traffic instruction. If the pilot incorrectly reads back an ATC instruction and the ATC controller does not correct the incorrect readback, this is not justification to reclassify the PD. Refer to Federal Register (FR) Interpretive Rule, Vol. 64, No. 62 (64 FR 15912) (April 1, 1999). c) If the ASI determines that ATC actions or processes were contributory to the event, the ASI will include “ATC” and rationale in block 6 of FAA Form 8020-19 (this information is reviewed by the ATC QAG). 9) Discovery of a Potential ATC Error. During the investigation, an ASI may determine that an error or other safety issue on the part of ATC played a role in the PD (or in the occurrence if it is determined that a PD did not occur). This information should be captured in either FAA Form 8020-18 or FAA Form 8020-19, as appropriate. 1) Develop a record of findings to be sent to the responsible office explaining the reason for the return of the report. Then the PD POC will send an email containing the findings to the respective office. 2) Forward the ATQA email notification from the submitting office to the ATQA Help Desk at 9-AWA-ATQA-Helpdesk@faa.gov, and request the Help Desk to return the report to the investigating office. NOTE: At the discretion of the PD POC, the above notification may be done in one email. E. Aviation Safety Action Program (ASAP) and Voluntary Disclosure Reporting Program (VDRP). In general, see Volume 11 and Volume 14 for VDRP and ASAP processing procedures. 1) The submission of an occurrence that has been accepted into VDRP or ASAP does not relieve the associated FAA office of the responsibility to complete all sections of FAA Form 8020-18. Such investigations are independent of the responsibilities specified in Volume 11, Volume 14, Order 2150.3, AC 120-66, Aviation Safety Action Program (ASAP), and AC 00-58, Voluntary Disclosure Reporting Program. 3) When completing FAA Form 8020-18, note that corrective action taken under the ASAP, to address a non-sole-source report of a PD, is not protected from disclosure under FAA Order 8000.82, Designation of Aviation Safety Action Program (ASAP) Information as Protected from Public Disclosure under 14 CFR Part 193; 14 CFR part 193; or Exemption 3 to Title 5 of the United States Code (5 U.S.C.) § 552, the Freedom of Information Act (FOIA). All pertinent information, including the corrective action, should be included in FAA Form 8020-18. Flight Standards Service personnel do not need to notate ASAP in block 18 of FAA Form 8020-18. 7-37 REPORTS OTHER THAN PDsMISCELLANEOUS OCCURRENCES. A. Forcible Seizure of Aircraft (Hijack). FAA personnel receiving information of a forcible seizure of an aircraft will immediately notify their manager, who in turn will immediately notify the Washington, D.C. Operations Center, through the ROC. B. Hazardous Materials (Hazmat). When a hazmat incident occurs, FAA personnel receiving the report must contact the Flight Standards Service Division Civil Aviation Security Field Office (CASFO) and give the appropriate information, including pertinent telephone numbers. C. Sonic Boom Complaints. When FAA personnel are notified of a sonic boom complaint, they will refer the matter to the nearest military installation. D. Unidentified Flying Object (UFO). If any FAA employee receives a report of a UFO, the individual making the report should be referred to the nearest scientific establishment or institution of higher learning that has expressed interest in such reports. If concern is expressed that life or property might be endangered, refer the individual to the local police department. E. Foreign Air Carrier Incidents. FAA Form 8020-23 will be completed and distributed for each foreign air carrier incident in ATQA. For additional detail, see Volume 12. 7-38 PREREQUISITES AND COORDINATION REQUIREMENTS. • Successful completion of the Inspector Indoctrination course, or equivalent. B. Coordination. This task requires coordination with Operations and Airworthiness supervisors, the ROC, the ATO QAG, ATC facility military liaison, and headquarters (HQ) military liaison. 7-39 REFERENCES, FORMS, AND JOB AIDS. • Title 14 CFR Part 101 Subpart E.
• Title 14 CFR Part 107. • Title 49 CFR Part 830 (National Transportation Safety Board (NTSB) Regulations). • Volume 11, Flight Standards Program. • Volume 12, International Aviation. • Volume 14, Compliance and Enforcement. • Volume 14, Chapter 1, Appendix 14-1, Compliance Philosophy and Pilot’s Bill of Rights Brochure. • Volume 15, Chapter 6, Section 1, subparagraph 15-6-1-5D, References. • Volume 16, Unmanned Aircraft Systems. • National and office policies specific to accident/incident investigation. • Office standard operating procedures (SOP), for standby telephone availability. • FAA Order 2150.3, FAA Compliance and Enforcement Program. • AC 00-58, Voluntary Disclosure Reporting Program. • AC 107-2, Small Unmanned Aircraft Systems (sUAS). • AC 120-66, Aviation Safety Action Program (ASAP). • PTRS Procedures Manual (PPM). • FAA Form 8020-2, Aircraft/Parts Identification & Release Tag. • FAA Form 8020-3, Facility Accident/Incident Notification Record. • FAA Form 8020-9, Aircraft Accident/Incident Preliminary Notice. • FAA Form 8020-11, Incident Report. • FAA Form 8020-17, Preliminary Pilot Deviation Report. • FAA Form 8020-18, Investigation of Pilot Deviation Report. • FAA Form 8020-19, Reclassification of Aviation Incident Report. • FAA Form 8020-23, FAA Accident/Incident Report. • Office accident investigation kit. • Sample figures and letters. • Special emphasis forms as required by notices or national policy. • Volume 14, Chapter 1, Section 2, Flight Standards Service Compliance Action Decision Procedure. 7-40 FUTURE ACTIVITIES. Conduct additional investigation to determine if additional deviations exist, if required. RESERVED. Paragraphs 7-41 through 7-60.